2. Theistic evolutionism fosters an anti-hierarchical vision of reality, including the Church and the family; the traditional doctrine of creation supports a hierarchical vision of reality, including the Church and the family. By denying each human father’s God-given responsibility to teach, govern, and sanctify his family, theistic evolutionism has contributed much to the emasculation and degradation of Catholic men. No longer reminded of his duty to teach, discipline, and spiritually direct his wife and children, the Catholic father now cheerfully abdicates his most important responsibilities, leaving his wife and his children’s teachers to teach, discipline, and sanctify his sons and daughters. [If the Father does not see his duty towards his wife and children in his role as a man and as Father, there's a problem there, which won't be solved by an extrinsic reminder as such. Again, the creation account is significant inasmuch as it teaches something about the real nature of man, male and female, and family.] But—since no one can take the place of a father—this is a burden they cannot bear. And so his abdication sets in motion the total disintegration of society. It is already evident from the contrast between these two definitions, that several things are mixed in here: what is being opposed is not only two doctrines of how God created the world, life, and languages, but also different hermeneutical approaches to understanding the natural world and interpreting Scripture. I'll come back to this point in a later post. 3. Theistic Evolutionism confuses and undermines the distinct divinely-instituted roles of men and women and indirectly contributes to the confusion of sexual roles. The traditional understanding of Genesis defines and strengthens the God-given roles of men and women and protects the dignity of both sexes and the leadership role of men. 4. Theistic evolutionism perverts the relationship between man and nature. The traditional doctrine of creation fosters a right relationship between man and nature. 5. The traditional understanding offers hope for the future of mankind. Theistic evolutionism fosters either a false hope or a deep despair. 6. Theistic evolutionism breeds indifference to the Lord’s Day and a wrong view of natural science. The Traditional doctrine of creation fosters appreciation and reverence for the Lord’s Day and a correct view of natural science. 7. The Traditional doctrine of creation fosters a realistic understanding of the spiritual forces of evil and attributes the evils of the world to man’s cooperation with them. By denying the literal historical of Genesis 1-11, theistic evolutionism blinds its adherents to the supernatural dimension of life, reduces many of the supernatural actions of God, angels, and demons, to natural causes, and thus makes its disciples unfit for spiritual warfare. 8. The Traditional doctrine of creation fosters an intimate relationship between Christians and God, their Creator, Redeemer, and Sanctifier. Theistic evolutionism erodes this intimacy. As many readers may know, last Friday, the feast of the Sacred Heart, began the year for priests, on the occasion of the 150th anniversary of the patron saint of parish priests, John Marie Vianney's birth into heaven. (It was entirely by coincidence that priestly ordinations here were on the same date; the ordinations were scheduled before the announcement of the year for priests.) Both in his letter proclaiming the year for priests, and in his homily on the opening day, he cited the saint's words, "The priesthood is the love of the heart of Jesus," words which reveal the tremendous gift of the priesthood, "tremendous" both in its original sense of awe-inspiring, and in its present sense of great. The Church needs holy priests; ministers who can help the faithful to experience the merciful love of the Lord and who are his convinced witnesses. In the Eucharistic Adoration that will follow the celebration of Vespers, let us ask the Lord to set the heart of every priest on fire with that "pastoral charity" which can enable him to assimilate his personal "I" into that Jesus the High Priest, so that he may be able to imitate Jesus in the most complete self-giving. 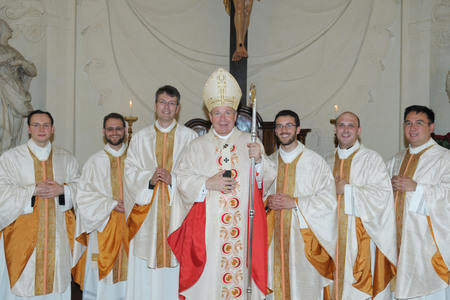 The six newly ordained priests with Cardinal Schönborn. Yesterday and today the Holy Father and representatives of the Roman Curia met with the bishops of Austria to speak about the situation of the diocese of Linz and the Church in Austria, as well as solutions for present problems. The Holy Father called to mind the urgency of a deepening of faith, of complete faithfulness to the Second Vatican Council and to the post-conciliar magisterium of the Church, and the renewal of catechesis in light of the Catechism of the Catholic Church. In addition, doctrinal and pastoral questions, and questions concerning the situation of clerics and laity, of the seminaries and theological faculties in Linz and in the other dioceses were discussed. The Austrian Bishops thanked the Holy Father for his fatherly care and for this meeting, a sign of his union with the Church in Austria, and declared their complete communion with and faithfulness to him. The Austrian bishops also thanked the Roman Curia for its fruitful collaboration and helpfulness.